Dr. Cleveland was born January 19, 1918 and passed away May 30, 2008. A Princeton University graduate in 1938, Dr. Cleveland was a Rhodes Scholar at Oxford University in the late 1930s; an economic warfare specialist (in Washington, D.C.) and United Nations relief and rehabilitation administrator (in Italy and China) in the 1940s. In 1948 he joined the Economic Cooperation Administration, where he served as Director of the China Aid Program, then developed and managed U.S. aid to eight East Asian countries, and later became (as Assistant Director for Europe of the Mutual Security Agency) the Washington-based supervisor of the Marshall Plan for European recovery in its fourth year, 1952. In early1953 he left Washington to become executive editor, and later also publisher, of The Reporter magazine. In 1956 he was appointed dean of the Maxwell Graduate School of Citizenship and Public Affairs at Syracuse University. He was a delegate from the state of New York to the 1960 Democratic National Convention in Los Angeles. 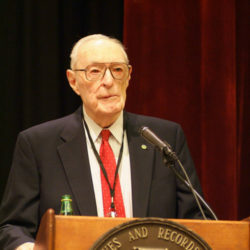 During the 1960s Harlan Cleveland served as Assistant Secretary of State for International Organization Affairs in the administration of President John F. Kennedy, and in 1965 was appointed by President Lyndon B. Johnson as U.S. Ambassador to NATO, serving in that post also under President Richard Nixon until May 1969. From 1969 to 1974 he was President of the University of Hawaii, of which he is now President Emeritus. From 1974 to 1980 he developed and directed the Program in International Affairs of The Aspen Institute, with headquarters both in Princeton, New Jersey, and in Aspen, Colorado. During 1977-78 he was also chairman of the U.S. Weather Modification Advisory Board. In 1979 he served for one semester as the Distinguished Visiting Tom Slick Professor of World Peace at the Lyndon B. Johnson School of Public Affairs, University of Texas at Austin. During the 1980s he served as the founding dean of the University of Minnesota’s Hubert H. Humphrey Institute of Public Affairs, a graduate school, research think-tank, and center for leadership education. He concurrently served two three-year terms as Trustee-at-Large of the University Corporation for Atmospheric Research in Boulder, Colorado. He retired as Professor Emeritus at the University of Minnesota, where he still has an office in the Humphrey Center. In 1991 he was elected to a five-year term as President of the World Academy of Art and Science, and in 1994 was elected Chairman of the Board of Directors of VITA (Volunteers in Technical Assistance), a private voluntary agency based in Arlington, Virginia that has long worked on information transfer to developing countries and is now experimenting with low-earth-orbit (LEO) satellites to bring into the world communication system people who still live “beyond the last telephone pole.” Harlan Cleveland has authored hundreds of magazine and journal articles, and eleven books, mostly on executive leadership and world affairs. The latest is Birth of a New World: An Open Moment for International Leadership(1993). Other books include The Knowledge Executive: Leadership in an Information Society (1985), republished in paperback 1989, and The Global Commons: Policy for the Planet 1990). From 1987 to 1993 he wrote a fortnightly column on world affairs for the Star Tribune, Newspaper of the Twin Cities. Read more about Dr. Cleveland.